“Okay – when I open the gate… you go!” Garith’s mind stone flared… his hands shaping an intricate pattern, duplicating the images formed in his mind, as he carefully opened the ‘lightway’ that would take this team to the rebel leaders. “Dell r’… get ‘em in there…” The ‘lightway’ flared as five shadowed figures moved toward the gate. Ramas watched as Dell r’ rushed through first… his great sword in a neutral position… not threatening… but instantly ready for action. A mountain of iron hard muscle… with arms like braided steel… flaxen hair tied back in a tight braid… facial features locked in a grim battle-set. “The stars be with you!” Ramas patted Rison on the shoulder as he stepped through with Muirisc tight by his side. “The stars be with you!” In the darkness of the chamber, Ramas reached out with one hand to encourage the final two travelers. He knew that the Council had assigned a ‘protector’ class warrior to the team at the last moment but he had not yet seen the man in person. There had not been enough time to check every detail of every plan… at some point he had to trust the judgement of other personnel. Briefly glimpsed intelligence reports indicated that he was some kind of giant Elf with archaic armor straight from the legends of ancient times. “Whoa! What was that…?” As the warrior surged passed, supporting the ‘ailing’ Ala, Ramas’ hand brushed the ‘protector’s’ armor. Instantly, his hand recoiled as if struck by a strong shock. Less than one second later both figures were gone and the gateway closed. In the tradition of Tolkien and Asimov this novel invites you to step into new worlds of thought! First and foremost, JDeVereS is a writer… whether generating ‘white papers’, technical manuals, magazine articles, poetry or science fiction/fantasy… he constantly seeks ways of improving life and helping people learn tolerance without preaching or lecturing! 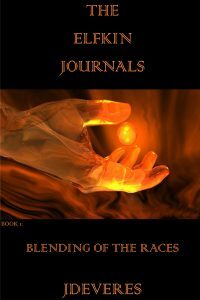 First published in his early twenties as both a poet and magazine article writer… he produced countless technical publications throughout his professional career, but forever dreamed of writing quality fiction… THE ELFKIN JOURNALS is the beginning of his dream fulfilled!